it's been a month since I posted a snap of a squirrel and I know how much mouse readers love squirrels! the last couple squirrel pics were of black squirrels (which were really gray squirrels) the photos stimulated a discussion about the variety of color that squirrels sport. have any of you ever seen a white squirrel? I hadn't until I started hanging out in oberlin; apparently there is a population of white squirrels that have been gracing the town green for generation after generation. none of my photos of the oberlin white squirrels are very good (these white squirrels are fast!). I have my friend j (who lives in oberlin) to thank for supplying me with this photo. the photo was taken by a mutual friend who is one crackjack snapper! this week cleveland is abuzz with the happenings at the rock and roll hall of fame as it is induction week. I can't believe the moody blues haven't been inducted yet. Interesting creatures--had never heard of a white squirrel. 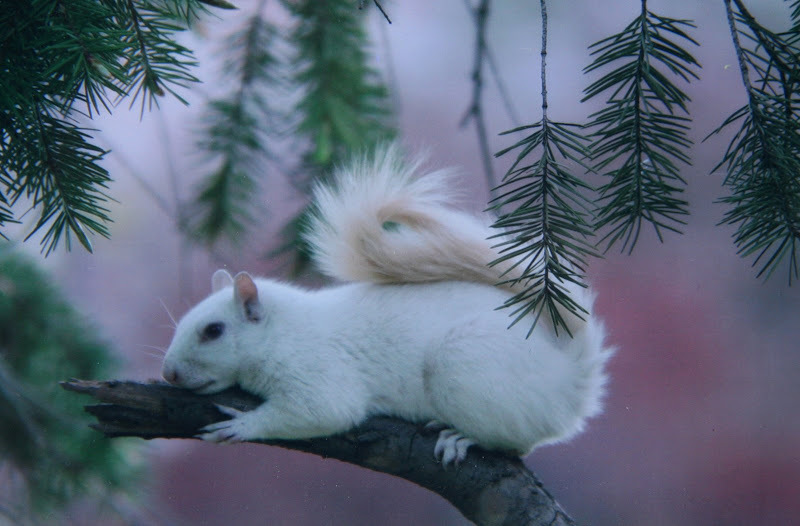 Thanks for the Oberlin link, which has another pic of a red-eyed albino white-- I noticed the tail on that one wasn't as "blond" as the tail on the squirrel pictured here. whoah! never saw a white squirrel before. That is a gorgeous shot, too. I saw a TV special on Oberlin once, it's quite unusual apparently to have so many white squirrels in one community. We have the odd albino kangaroo does that count? Yeah, I have yet to still snap some shots of our local squirrels which is something I know you'd love to see. Just the other day, I heard them squeaking at each other; the ones in my area are very active and vocal. Wow I forgot all about the Moody Blues! Go figure. We have some white squirrels in DC, too, also black squirrels. Our squirrel population is tres chic! Ooh, I love Nights in White Satin. Very romantic memories there. my first time seeing one like this...dang! Ah, the Moody Blues, that brings back the memories. The costumes are a bit much though.